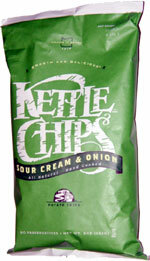 Taste test: These chips were excellent, with a tasty sour cream and onion seasoning and a great potato taste. There was plenty of flavor seasoning, and the flavor itself was creamy and mild. The chips were generally oblong in shape, with a somewhat thick thick cut and a soft crunch. Like most Kettle Chips, the underlying chip had an intense potato taste. Smell test: Nice potatoey smell, with a slight sweet onion smell mixed in.